It (1927). 72 minutes. Directed by Clarence G. Badger. Starring Clara Bow (as Betty Lou Spence), Antonio Moreno (as Cyrus Waltham, Jr.), William Austin (as Monty), Jacqueline Gadsden (as Adela Van Norman), Priscilla Bonner (as Molly), Gary Cooper (as reporter), and Elinor Glyn (as herself). I Married a Witch (1942). 77 minutes. Directed by René Clair. 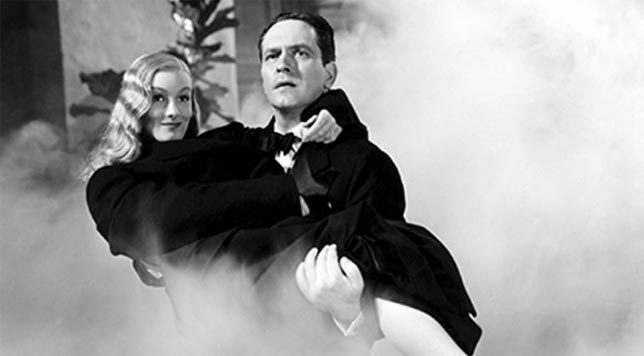 Starring Fredric March (as Wallace Wooley), Veronica Lake (as Jennifer), Cecil Kellaway (as Daniel), Susan Hayward (as Estelle Masterson), and Robert Warwick (as J. B. Masterson). Saratoga (1937). 92 minutes. Directed by Jack Conway. Starring Jean Harlow (as Carol Clayton), Clark Gable (as Duke Bradley), Walter Pidgeon (as Hartley Madison), Lionel Barrymore (as Grandpa Clayton), Una Merkel (as Fritzi), Frank Morgan (as Jesse Kiffmeyer), and Hattie McDaniel (as Rosetta). Saratoga is Jean Harlow’s final film. She collapsed on the set on May 20, 1937 with 90% of shooting completed, and after a drawn-out series of medical consultations was eventually diagnosed with kidney failure. Her illness was likely brought on by a childhood bout of scarlet fever and was complicated by her reaction to oral surgery and a recent sun poisoning incident. Unfortunately, even if Harlow’s kidney failure had been diagnosed immediately, her chances of survival were very low: modern dialysis treatment was not a possibility at the time. Harlow slipped into a coma on June 6 and died the following day. Ball of Fire (1941). 111 minutes. Directed by Howard Hawks. Starring Barbara Stanwyck (as Katherine “Pussyfoot” O’Shea), Gary Cooper (as Professor Bertram Potts), S. Z. Sakall (as Professor Magenbruch), Richard Haydn (as Professor Oddley), and Dana Andrews (as Joe Lilac). Screenplay by Billy Wilder. The Bride Came C.O.D. (1941). 92 minutes. Directed by William Keighley. Starring James Cagney (as Steve Collins), Bette Davis (as Joan Winfield), Eugene Pallette (as Lucius Winfield), and Harry Davenport (as “Pop” Tolliver). The Bride Came C.O.D. is reminiscent of two other films that I have reviewed recently. Like von Stroheim’s Greed, it was filmed in Death Valley when temperatures were high. Like It Happened One Night, it features a wealthy heiress who wants to marry a dashing celebrity of whom her father disapproves, and the plot involves her displacement and an elaborate hunt to locate her. Ninotchka (1939). 110 minutes. Directed by Ernst Lubitsch. Starring Greta Garbo (as Nina Ivanovna “Ninotchka” Yakushova), Melvyn Douglas (as Count Leon d’Algout), and Ina Claire (as Grand Duchess Swana). Written by Billy Wilder, Charles Brackett, Walter Reisch, and Melchior Lengyel. It Happened One Night (1934). 105 minutes. Directed by Frank Capra. Starring Claudette Colbert (as Ellie Andrews), Clark Gable (as Peter Warne), and Walter Connolly (as Alexander Andrews).